A volcano is a geological rupture in the Earth's crust triggered by natural forces, such as pressure and temperature in the interior of the Earth. These forces drive gases and hot liquid, known as magma, out through a volcano's orifice known as vent. Once out of the vent, these erupted materials break down, harden or condense around a volcano's vent. Over thousands or millions of years, the accumulation of magma forms steep-sided cones known as volcanoes. Volcanoes have been erupting molten material, after the formation of the earth, due to the accumulated pressure in the interior of the planet. The formation of volcanoes have contributed to the shaping and configuration of the varied landscapes that make up the planet. 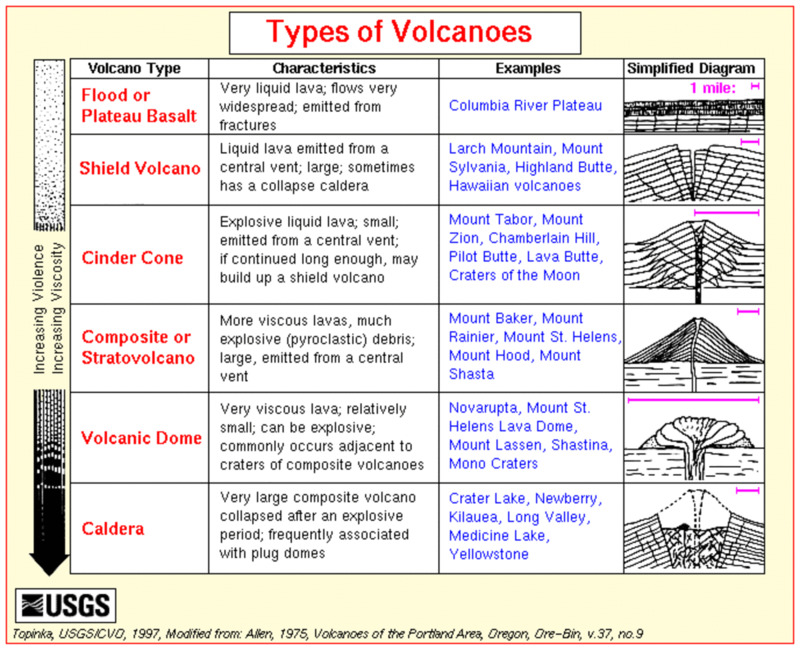 Volcanoes are most commonly formed at the convergence or divergence of tectonic plates. 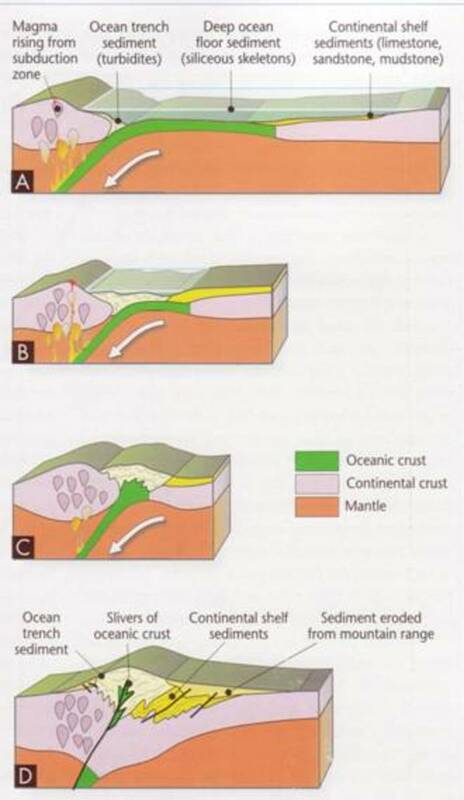 For example in Mid-Ocean Ridges, where tectonic plates spread apart and subduction zones, where one tectonic plate sinks into the earth´s mantle underneath another tectonic plate. 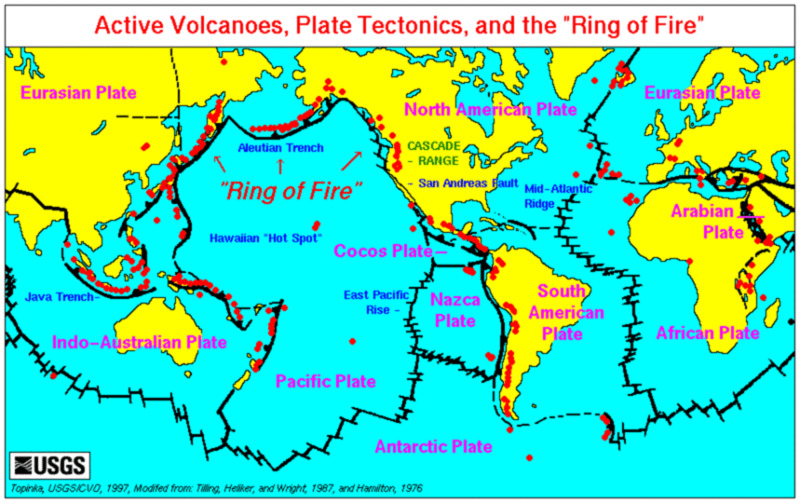 Others may form close to or in the middle of tectonic plates, such as Island Arcs and Hotspots. Some others form on the continents, such as in the Continental Rifts. How a Volcano is Created? The Earth’s crust is composed of enormous sections of rock called tectonic plates. Tectonic plates resemble puzzle pieces which move constantly against each other. Volcanoes often form in the areas where tectonic plates make contact. 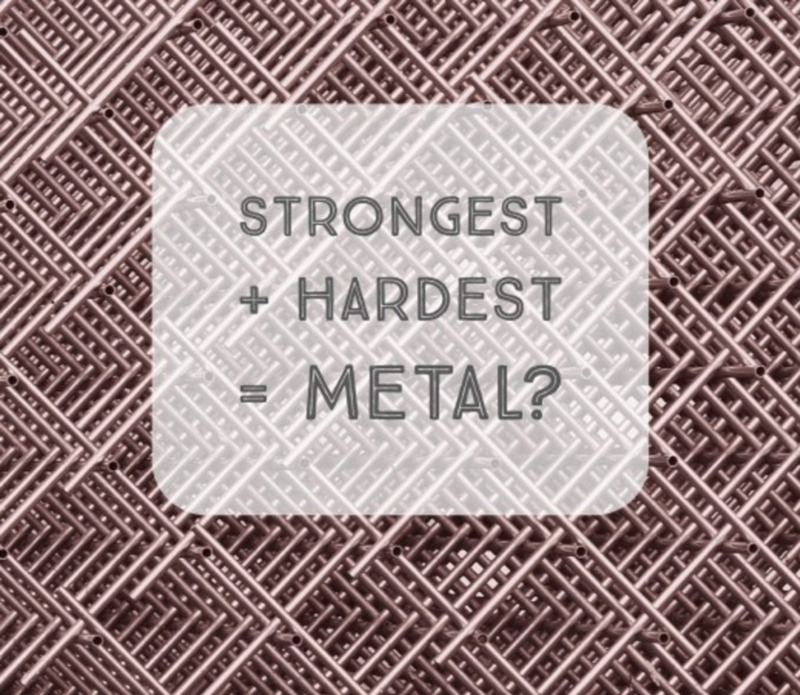 The friction created between two plates by the constant movement melts the Earth’s crust, causing the rock underneath the crust to turn into magma due to the great temperatures created by friction. The now molten hot rock or magma creates great pressure, and over time, it finds its way through the fractures in the plates. Once magma reaches the surface of the Earth, it is called lava. Approximately 1500 volcanoes around the world are considered active, and from these, nearly 90% lie in the Ring of Fire, which is a ring of oceanic volcanoes circling the Pacific Ocean. Most divergent plate boundaries lie in the bottom of the oceans. That is why most volcanic activity occurs in the oceans. Volcanoes may be formed at subduction zones. 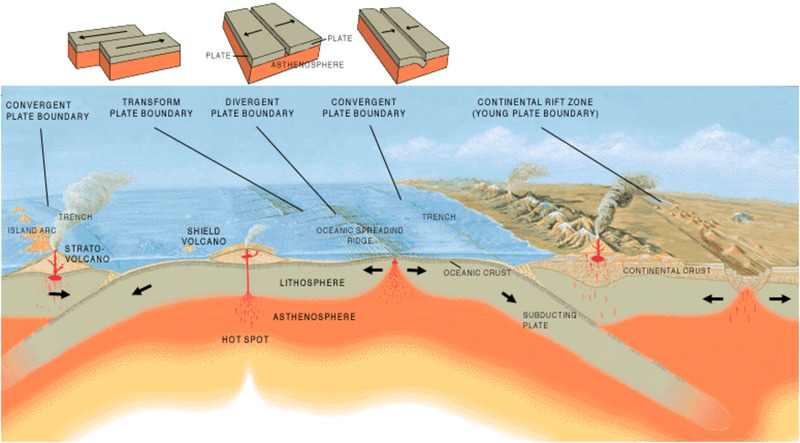 A subduction zone is a place where two plates, one oceanic plate and one continental plate, collide. At a subduction zone, an oceanic plate submerges under a continental plate. The friction creates magma. When magma reaches the surface, then, a volcano is formed. A typical example of this type of volcano is Mount Etna on the east coast of Italy. 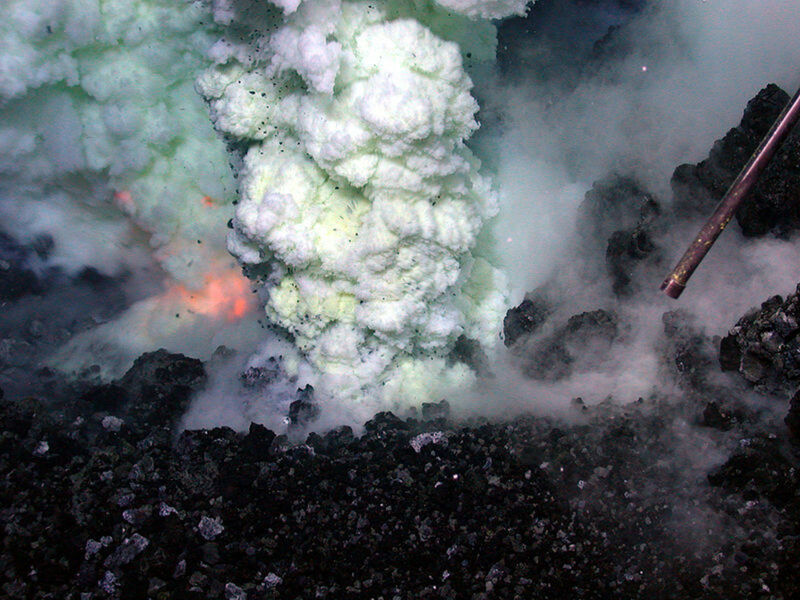 Although most volcanoes are formed in the Ring of Fire under water, there are some that are formed on land. Volcanoes on land, away from tectonic plate boundaries, are known as hotspots. They are formed from rising magma intrusions called mantle plumes. Hotspots are stationary regions of magma chambers under the Earth’s crust. 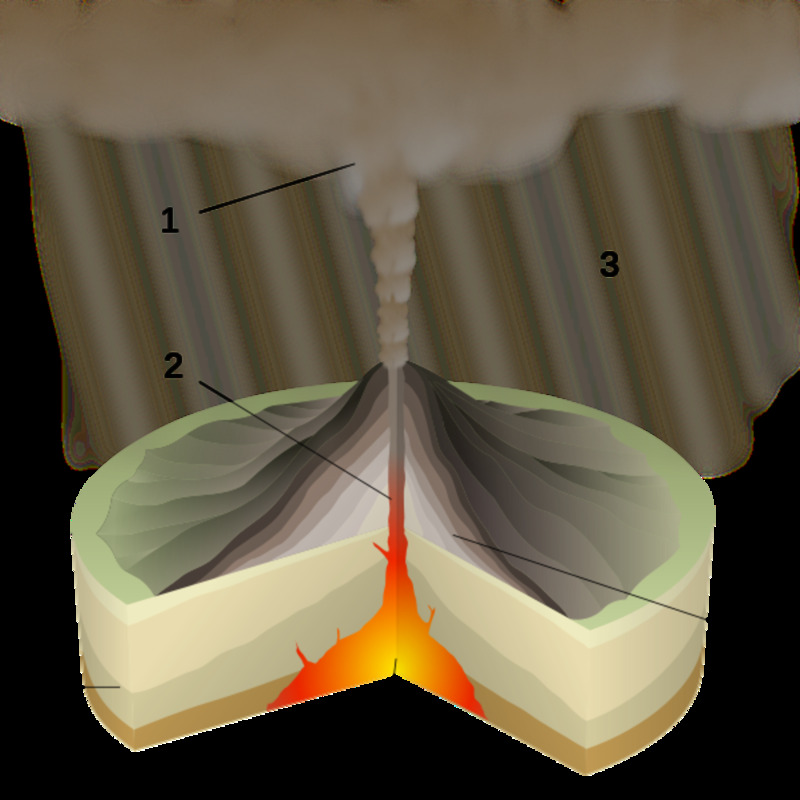 When a mantle plume forms a volcano over hotspot, the movement of the continental plate moves the new formed volcano and exposes new parts of the plate for more volcano formations, creating what is known as volcanic chains. The Hawaiian Islands were formed like this. Before the formation of a volcano, the Earth's natural forces, such as pressure and temperature, push magma out of the magma chamber, which is a large underground pool of liquid rock, until it erupts as lava on the surface of the Earth or as a boiling gush under the ocean. When molten rock or magma reaches the surface of the Earth either on land or the bottom of the oceans, it cools and hardens. Much of the Earth's crust is made of basaltic lava, which is the most common igneous rock, and nearly all the ocean floor is made of basalt, as well. Flood lava spreads over flat land, and as it piles up, it forms thick basaltic lava plateaus, known as flood basalts. One of the largest flood basalts, ever created on the surface of the Earth, is the Columbia River Plateau, covering Idaho, Oregon and Washington in the United States. The cracks or openings through where magma is forced out of the magma chamber are called volcanic vents. Magma gets ejected as lava through these openings. When internal heat and pressure inside the Earth force liquid lava out through a central vent, incandescent jet sprays of molten lava, rock and gases can reach hundreds of meters high into the sky. They may send volcanic material into the sky periodically or incessantly for an extended period of time. Over time, the volcanic fragments build-up around a vent gradually forming layers of volcanic material. Shield volcanoes are some of the largest volcanoes on Earth with slopes of a few degrees at the further lower end, and medium height slopes of about 10 degrees which flattens at the summit of the volcano. The gentle slope in Shield volcanoes is produced by basaltic lava flows of low viscosity. 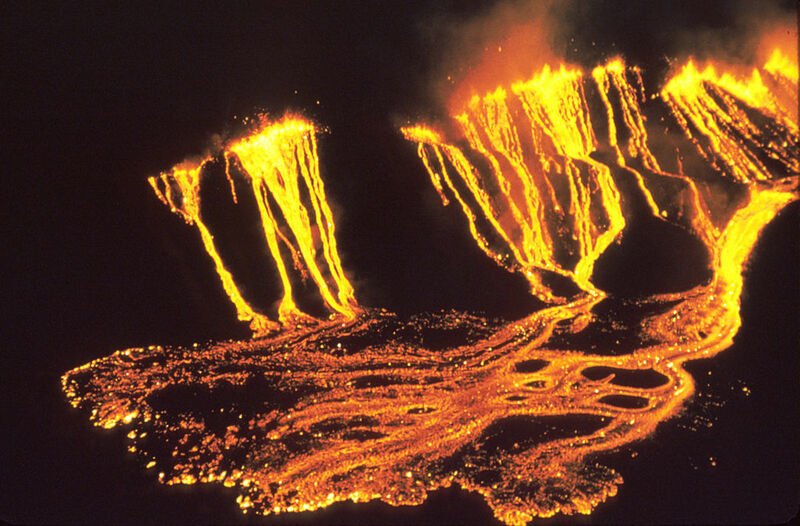 This type of lava can flow over long distances before it cools down and solidifies. Mauna Loa in Hawaii, 17 km (10.5 miles) high, is a Shield volcano with a gentle slope from the base to the top. Composite volcanoes, also known as stratovolcanoes, are formed from high viscosity basaltic lava. This type of lava flows slowly due to its high density composition. Over time, high viscosity lava builds up steep-sided conical mountains. During the process of formation of this type of volcanoes, basaltic lava eruptions flow slowly and harden faster than low viscosity lava, providing in each eruption a thick basaltic layer on which successive basaltic lava layers build up. Composite volcanoes are mostly found on the continental plates. Mount Rainier with a height of 4.4 km (2.7 miles) in Washington and Mount Fuji, at 3.7 km (2.3 miles), in Japan are both composite volcanoes. Hotspots are volcanoes that result from the movement of tectonic plates underneath them. It is believed that during the creation of this type of volcanoes the underlying mantle is extremely hot compared to the mantle in other underground regions. These types of volcanoes are formed from vents that find its way to the surface due to the hot temperature and pressure in the magma chamber. As the overlying layer of the Earth's crust moves due to tectonics, the original volcano moves, as well. With successive tectonic plate movements, more volcanoes are created in a chain. 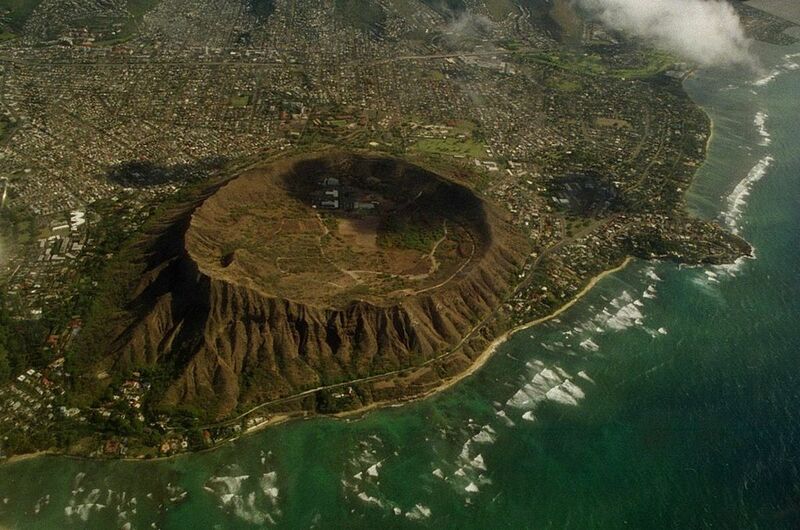 The Hawaiian Islands were formed from a hotspot in the mantle. Cinder cone volcanoes are the smallest type of volcano. They form from small lava fragments (tephra). 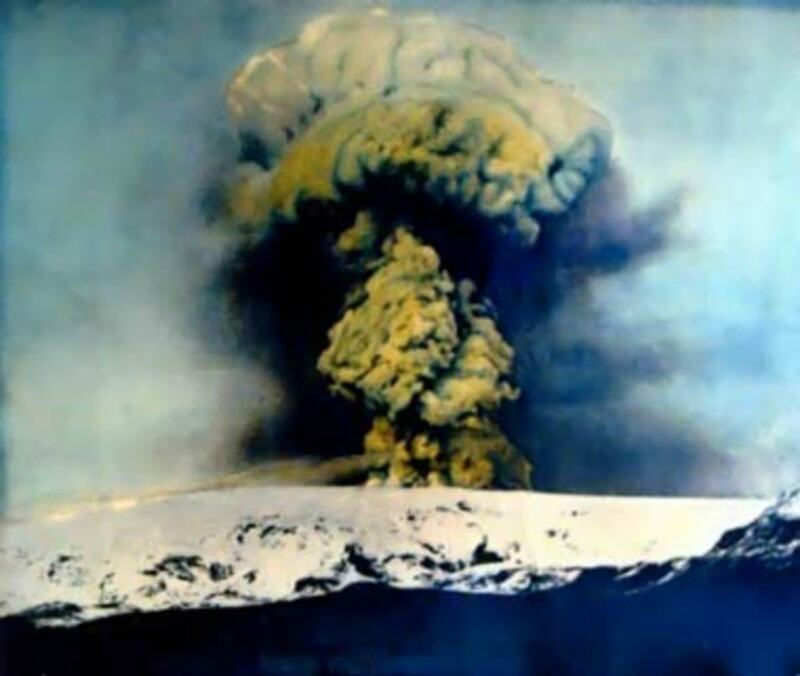 As the lava is erupted into the air, it breaks down into its constituent elements that fall down as lapilli and ash, which solidify around the vent, forming a circular cone. Cinder cones normally have a bowl-shaped crater at the top and rarely rise above 300 meters (985 ft.). Lava domes are formed from high viscosity basaltic lava which barely flows. This type of lava often creates a volcanic dome over and around its vent. When the dome hardens, it can trap gases, creating pressure. When the pressure is big enough, the dome is blown away to pieces in a violent eruption. A lava dome started developing on Mt. St. Helens shortly after the 1980 eruption. Submarine volcanoes are very common in the ocean floor. Many lie at great ocean depths, unable to reveal their explosive presence due to the extreme weight and cooling effect of ocean water above them. Others, lying at more shallow waters, may reveal their presence by blowing steam and rocky debris above the surface of the sea. Sometimes, submarine volcanoes may form steep pillars over their volcanic vents. 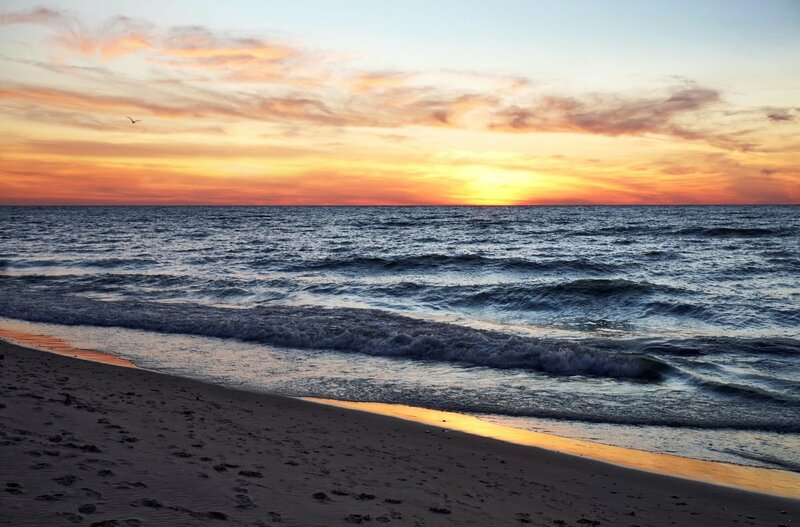 Some may grow so large that they reach the ocean surface, forming new islands. The San Juan Islands in the state of Washington may have formed from this type of eruption. Calderas are huge circular topographic depressions that are formed when a volcanic eruption empties a deep magma chamber, causing the collapse of the overlying land. Calderas can range in size from 4-6 km (2.5-3.7 miles) to up to 50 km (31 miles) wide. Over time, an old magma chamber may fill again with magma, forcing the floor of the caldera to rise. It may remain like this or repeated eruptions may reshape the caldera over and over again in a process known as resurgent caldera. Crater Lake in Oregon, which is an 8 km (5 miles) wide and 600 meters (1970 ft.) caldera, was formed in this way. The crustsof Mercury, Venus, Earth, Mars and the Moon (the inner planets) are made of basaltic rock. More than 95% of the Earth’s first 16 km (10 miles) of crust is made of igneous rock (basalt) formed from lava eruptions. Mt. Etna in Italy has been erupting for more than 3,500 years. 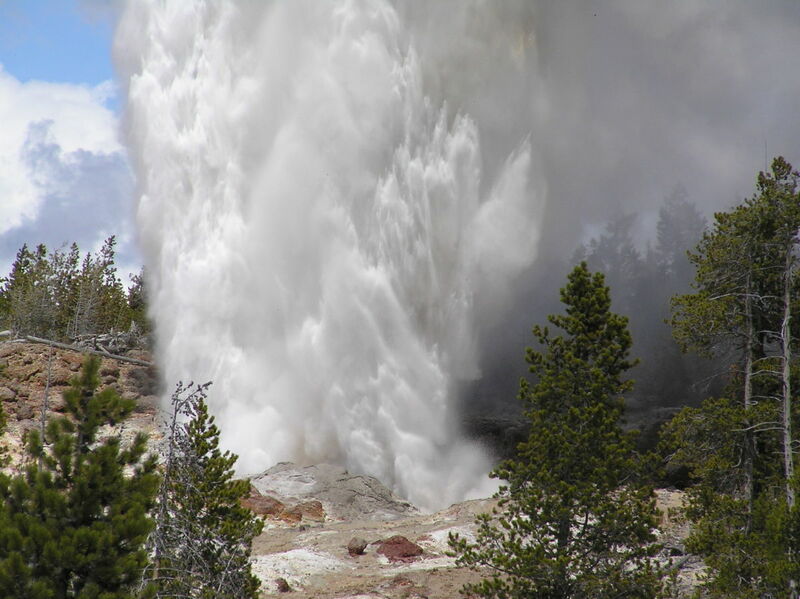 The first eruption occurred in 1,500 BC. Kilaueavolcano in Hawaii is a youngest shield volcano which has been erupting continuously since 1983. The Hawaiian islands formed over a hotspot in the middle of the Pacific plate. The continuous eruption of lava forms volcanoes, and it may take several hundred years for them to develop. Dormant volcanoes are those that may remain inactive for long periods of time, but might erupt suddenly at any moment. What happens after a volcano has errupted? After a volcanic eruption, lava usually continues to flow causing fires and changing nearby landscapes. Ash often travels far away, affecting airplanes and crops and landing in rivers and lakes in other regions; ash, may also affect humans and animals. While lava and ash from a volcano may damage technology and humans, it may also provide some benefits, including nutrients that plants and trees need to grow. How are mud volcanoes formed? This volcano is a mixture of mud, water and gases that are ejected during an eruption; this type of eruption does not eject lava and is not driven by magmatic activity. It may result from the perforation made by mud diapir on the earth´s crust or the bottom of the ocean. Mud volcanoes vary in size from just a few meters to several hundred km high and 10 km wide. How do volcanoes form on the ocean floor? They are formed due to the activity of the earth´s lithosphere by plate tectonics. The natural activity of the planet, such as tidal changes, earth´s rotation, gravitational pull cause tectonic plates to shift and collide. This movement of tectonic plates underwater causes underwater volcanoes to form where two tectonic plates meet, most commonly at convergent and divergent boundaries. Do earthquakes happen after volcanoes erupt? Not always do earthquakes happen after volcanoes erupt. Earthquakes are driven by plate tectonics, the same as volcanism. When an earthquake occurs, it may be due to plate tectonic movement in the earth´s crust. While an eruption can produce crust movement, it is not as strong as when the earth´s plates slide past each other. Lava is made underground at around 160 km (100 miles) or more underground where temperatures are hot enough to melt rock. Molten rock underground is called magma, once it is erupted out through a volcano, It´s called lava. Why is the earth's interior so hot? The interior of the earth obtains its heat energy from three sources; ther primordial heat or the heat from when the earth first formed, the frictional heat or the heat produced by the sinking material to the center of the earth and the radioactive decay of isotopes in the crust and mantle of the earth. Is Mount Everest an active volcano? Hawaii's Volcanoes: Ring of Fire or Geothermal Hotspots?? Yes, Scandinavia is close to Iceland, which is a region of high volcanic activity. I´ll check on Laacher Volcano in Germany. Thanks for reading and commenting on this hub. Quote from starbright: "Our nearest volcano is probably on Iceland I believe." Iceland's volcanoes would be closest to Scandinavia yes because most of them are active, but if you want an even closer volcano you should look up Laacher See Volcano in Germany. It is a dormant volcano for the time being, roughly the same size as Mount Pinatubo Volcano in the Philippines, which made the larges eruption recorded in the 20th century. 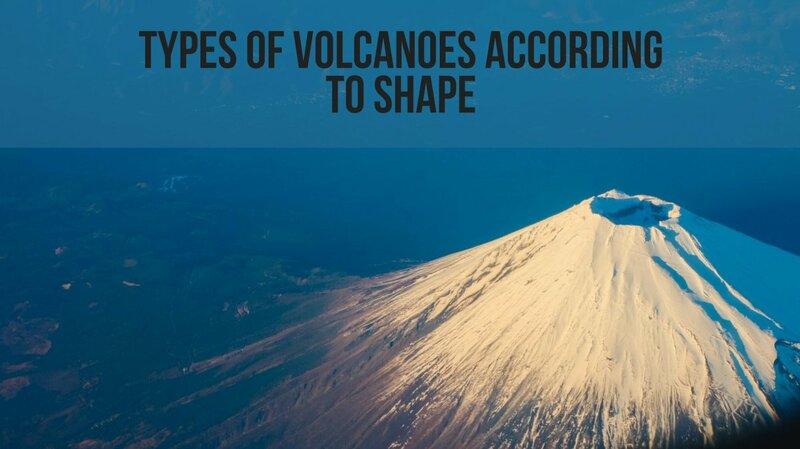 That is a fascinating and comprehensive account of the science of volcanoes. I have never personally witnessed a volcano erupting. However, I have spent time in the south of Italy very close to Vesuvius and indeed walked the desolate streets of the ruined city of Pompei. There are human bodies on display that have been effectively fossilized in cooled down volcanic lava and ash. A very impressive and moving experience. Sometimes, volcanic eruptions can change the scenic landscape much beautifully. Unfortunately, most eruptions have caused distress and loss of lives. It is good to be aware of the dangers of these natural phenomena, so as to react accordingly. There have been eruptions which have killed people in less than 4 hours. That is the case of Armero in Colombia. The most beautiful and / or interesting 'acts of nature' are very often the most dangerous. Stay safe unvrso. Thanks for spending your time to read this hub. I live close to one volcano called "Popocateptl" which was dormant for a while, but has been showing signs of activity recently. Even though I live 35 miles from it, I wouldn't want to witness an explosion. Very interesting subject, which until I'd read your hub I didn't know much about. Our nearest volcano is probably on Iceland I believe. An eruption is quite fascinating to see and although I haven't seen one first hand, I have visited Pompeii, which is particularly interesting as the devastation that Vesuvius left in its wake hundreds of years ago, can still be seen. Thanks so much for sharing - it's renewed my interest to find out more. Voted up as interesting. Now I can talk intelligently about magma and lava. Thanks to your well-presented hub and the video as well. My recent hub on the active volcano on the Caribbean island of Montserrat (https://msdora.hubpages.com/hub/Montserrat-Before-... even means more to me now.